You’ve read the Nook gadget reviews on Engadget, WSJ, NYT and pretty much everywhere else. After many days with the new Nook e-Book Reader from Barnes & Noble I’m ready to offer my opinion on the Nook as an e-Book reader. I’ll be doing some direct comparing to the Kindle as well since I see the Nook as a formidable challenger to the Kindle’s current dominance in the e-Reader realm. While I definitely agree that the Nook was rushed to market and has some issues, I’ll explain why I differ from most reviews you’ve read on the conclusion. The Nook is a strong competitor to the Kindle – one I think still could win out over time as they update the UI a bit. Note: The companion review of the Nook – from the non-geek’s perspective can be found here. If you’re a Kindle owner, you’re probably already pretty smug about your decision to go with the Kindle instead of the Nook after reading many of the Nook reviews these past days. While I totally understand that sentiment, I think there are areas where the Nook really wins – and some things that will surprise even the most seasoned e-Reader owner. While far from perfect, I think the Nook just might be the e-Book reader for me. Read on to see why. What makes one interested in the Nook when the Kindle is so popular? The Nook arrives deep in plastic and cardboard packaging. It includes a little “Instructions to unpack your nook” how-to (yes seriously) and a getting started guide. The Nook e-Reader itself comes with a USB/charger cable and the full product guide on the Nook itself of course. That’s it. 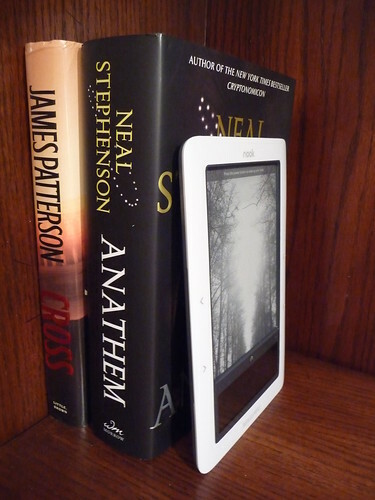 Check out the Nook first-look and unboxing photos here to see more. My Nook e-Reader arrived last week in packaging that was noticeably larger than the understated Kindle packaging – probably due to the fact the Nook will sell in retail stores as well as online. 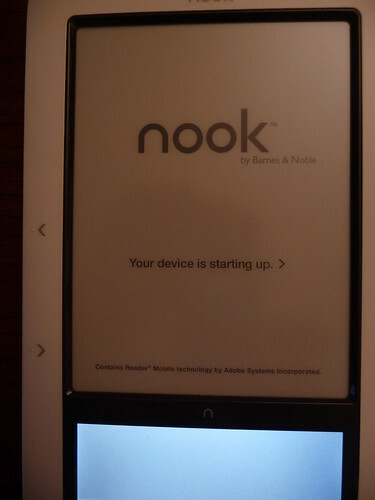 Once the Nook was rescued from its packaging I immediately began comparing it to the Kindle. The Nook, while somewhat different than the Kindle is really quite similar in many ways. It is in a white casing, has a similar-sized black & white e-Ink screen, buttons on the left and right, an on/off switch on top of the device and a USB power port on the bottom of the device. But it also has many characteristics that distinguish it from the Kindle. 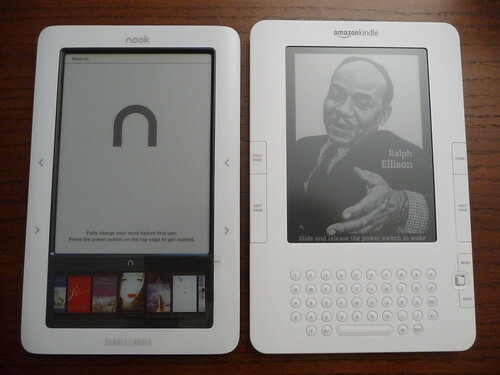 Things like the lack of a physical keyboard, a smaller area of plastic around the e-Ink screen, a flashy, color, touch-screen below the e-Ink screen, different button placement all differentiate the Nook from the Kindle. Below is a photo of the bottom of the Nook. There you find the two mono speakers, the stereo headphone jack and the Micro-USB port for charging and tethering. The next photo below is the top of the Nook. The center button there is the power on/off button which also puts your nook to sleep, powers it entirely off and on. While the Nook is slightly smaller in width, it’s also slightly heavier and bulkier (thicker) than the Kindle – not terribly so, but something the Kindle user would notice as a difference. Don’t get too caught up in this fact though as the Nook only weighs 1 ounce heavier (11.02oz Nook versus 10.2oz for the Kindle.) The thickness of the Nook is a little more noticeable: .5” on Nook versus .36” on the Kindle. The back of the Nook is thicker on the two sides than it is in the middle back – sort of contoured which makes it pretty easy to hold in one or two hands. If you have the Nook and the Kindle sitting next to each other, the Nook definitely looks a little “flashier” with its color touch-screen (note the e-Ink screen is not color.) The lack of the physical keyboard on the Nook makes it look a little less awkward also. I give the Nook a slight edge up on the Kindle in the looks category although the extra bulk added to the Nook since it’s thicker takes away from that edge in my opinion. The Nook, like its Kindle cousin is extremely comfortable to hold during long readings one-handed or two handed. Much easier to hold a Nook or Kindle one-handed then it is a hardcover book – and still a little easier to hold than a paperback in my opinion. Barnes & Noble has the Nook priced at $259, the same price Amazon sells the Kindle. I expect the two companies will work to match the price of the two devices for some time. The real price differentiator will likely be found with the price of the books at the competing e-Book stores. In my research, the Amazon Kindle store has been the one to beat in terms of both price and selection although Barnes & Noble seems to have been working on that over the past few weeks bringing their eBooks at or close to the cheapest price. Barnes & Noble also has the google books included in their store which offers many older books for free although you’ll find the quality of the e-Books from google books a little less polished since they’ve been scanned and were obviously not reproduced for the e-Book in perfect form. You can do a search on prices for e-Books yourself by using InkMesh. When it comes to buttons the Nook differs from the Kindle in many important ways. The Nook has no physical keyboard. This helps tremendously in the beauty department, but is a slight takeaway in usability since you have several key presses to get to the touch screen keyboard on the Nook. Also missing on the Nook is the back, home and font buttons you find on the Kindle. When it comes to buttons, the Nook is quite minimalist. In my book, the next and previous buttons on both sides is a huge improvement over the Kindle – I know it seems like a small thing, but it really is a nice touch – especially if you read one-handed at times. On the negative side, I sort of miss the home and back buttons I’m used to from the Kindle. 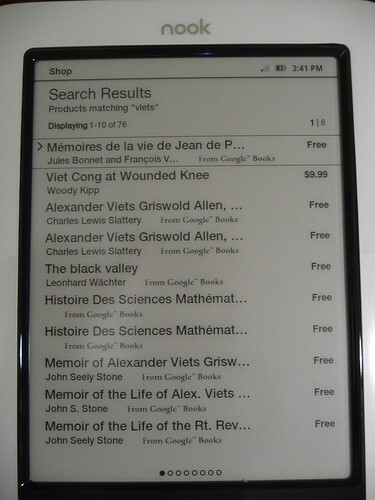 The Menu button is noted on the Nook by the upside-down horseshoe right in between the e-Ink screen and the touch screen of the Nook. The menu button on the Nook turns on the touch screen and also takes you to the main menu of that screen. This one button will be pressed many times as you use your Nook because nearly everything except for page-turning is controlled with that touch screen. This is where the UI problems rear their ugly head on the current iteration of the Nook software. There is no five-way controller, joystick-like controller to move your cursor around on the Nook like there is on the Kindle. In its place is a up-down “button” on the touch screen that appears when necessary. I, like many other reviewers think the touch screen user interface needs some work. It works most times, but requires too many key-presses to get where you want to go and there are times when the touch-screen just isn’t as responsive as you expect it to be. I’ll admit that while I’m a gadget junkie at heart, I prefer the simplicity of the Kindle UI with its awkward 5-way controller to move the cursor around the e-Ink screen. My number one peeve with the UI is the multiple key-presses required to do much of anything except page turning. For example, click “reading now” from the menu or select the book you want to read from your library – it doesn’t take you to the book or the last place you left reading last time. Instead it gives you the summary of the book and asks you to press “read” again to get to that page in the book. Annoying and unnecessary. Now with that out of the way let me get this out there. I wholeheartedly believe that we’ll see updates to this device that improves that UI in a big way. It will take time to do this, but I think it will happen. How long is obviously the question. The cover view of the touch-screen looks great. It shows covers of the books your viewing whether they be in the Nook store or your personal library. You can scan through the covers with a swipe of the hand as you would expect. All of you dead-tree book reading folks out there might be confused by this one, but it’s important so listen up. The speed of the page-turning on a e-Book Reader device is very important. Unfortunately the Nook seems to be about 15% slower at page turning than the Kindle. Again, something I think we’ll see improved with firmware updates to the Nook. Is it so slow it’s painful? No. Do I as a Kindle owner notice the difference? Yes although it’s still fast enough for me. Something you will notice is the Nook takes a while to power on. The photo below is the screen you’ll see while you’re waiting for it to power up for many seconds – much longer than with the Kindle. 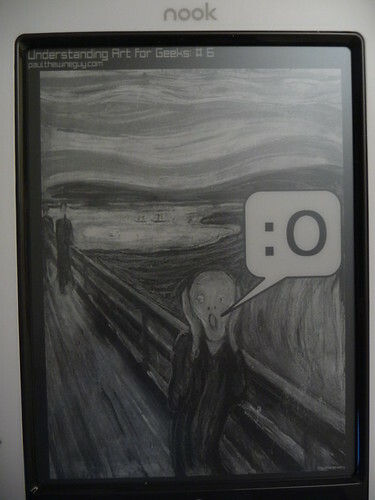 The e-Ink screen on the Nook is very comparable to the Kindle’s. They both have a soft background with very clear letters that are easy to read – just as easy as with a paper page. The Nook print The Nook offers three different fonts and five different font sizes. I really like the ability to switch fonts on the Nook – something you cannot do on the Kindle (although the Kindle offers six font sizes instead of just five.) Overall, the Nook is every bit as easy to read as the Kindle. One thing I had hoped the Nook would bring to the table is folders and tagging – something still missing from the Kindle. Unfortunately, these are missing features on the Nook as well. The Nook (and Kindle) can hold thousands of books all on one device, but imagine sifting through even 200 or so books when there is no way to create folders and move books to and from the folders. Instead we’re left to either have pages and pages of books listed on the screen or constantly archive and un-archive books. Like the Kindle, the Nook offers the ability to search your book for a word or phrase and has a built-in dictionary for easy word look-up. You can also annotate and bookmark text on your Nook using the interface. The battery on the Nook is removable! Something we’ll all appreciate after a few years of use and something the Nook easily wins over the non-removable Kindle battery. 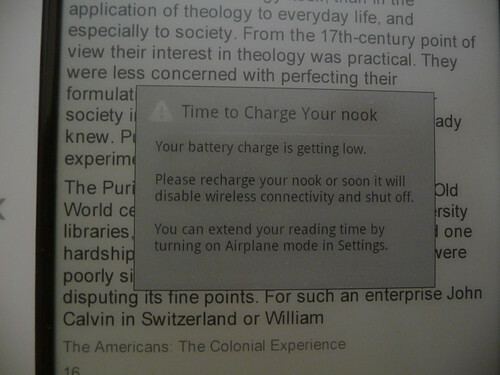 The bad news is that the Nook needs to be charged more often than the Kindle. I personally think this has to do with the Nook’s touch-screen and probably again software optimization since the battery in the Nook is a 1530mAh just like you have in the Kindle. The Kindle global version even received a firmware update recently that improved battery life by a bunch. Again watch for battery life improvements on the Nook via future firmware updates. For now though it lags behind the Kindle in this battery life category although over time the Kindle user will likely see their battery degrade without any way of getting that battery out to replace it. The Nook allows you to connect to your computer and browse the files on the Nook from your computer's file browser. In there you'll see the book and periodical files, screen-shots you've saved, clippings bookmarks and annotations, audio files and photo files. Transfer via the USB tether is fast and you can charge from the USB cord as well. While the nook hardware apparently has text-to-speech capability based on some teardowns of the device I’ve seen, text-to-speech is not currently a useable feature. If you’re one that would use this feature, the Kindle is the better option obviously. This is something of a head scratcher for me. With the Android-based OS inside and a touch-screen UI, you would think a web browser would be a no-brainer. But there is no web browser on the nook. Sure the Kindle web browser leaves a lot (and I mean a lot) to be desired, but it’s nice to have it. I download from other e-book sites like Project Gutenberg wirelessly on the Kindle and I’d like to be able to do that on the Nook. Here’s another thing I hope they’ll add via firmware update. This one goes under the nice-to-have category, but I LOVE the fact that you can easily add custom images to the Nook without needing to hack your e-Reader. This is something I see Kindle users struggling with and the Nook makes it so simple. It just makes it that much easier to personalize the device. Adding photos for this purpose is as easy as tethering your Nook to a computer and dragging the photos to the Nook “drive.” You can even set up custom screen-saver folders in themes. For instance I set one up for Holidays with Christmas and New Years images that the Nook will rotate through each time it goes in sleep mode. Those custom folders are easily selected from the touch-screen interface. Like the Kindle, the Nook can play back MP3 music and non-DRMd audiobooks. Unlike the Kindle, the Nook’ MP3 interface is usable – mostly because of the touch-screen interface on the bottom part of the Nook. The Nook has WiFi – something I think is a big plus over the Kindle. Yes, I require a 3G connection (like both the Nook & Kindle have) but WiFi offers a way to access the Nook store wirelessly even when you’re out of range from the 3G network. I also see other uses of a WiFi connection down the road – ways to send or receive files to the Nook wirelessly instead of needing the USB cable to tether. The Kindle recently added PDF capabilities to it’s repertoire and the Nook brings PDF to the table as well. The Nook can handle full page, single page reflow, table of contents and hyperlinks features of PDFs. The main things missing on the Nook PDF capability that I found was no landscape mode and no screen-shot capability. The Nook OS is powered by an Android-based system – supposedly Android 1.5 along with Linux 2.6.27 (Kindle is Linux 2.6.22 per mobileread). By itself this may not sound like much, but it opens up the possibility of 3rd party apps for Android that makes the device that much more interesting. I think you can see how this feature adds value to your e-book reader. And you can see why Amazon is still clinging to its policy of not supporting it – it’s about selling books… But another reason the Nook’s support for the ePub format is important for consumers is the ability to read e-books from other readers on the Nook. It has been confirmed that you can read e-Pub books from the Sony e-readers on the Nook and I’m guessing that works the other way as well. I was able to test out the lending feature of the Nook with Len Edgerly of the Kindle Chronicles Podcast. 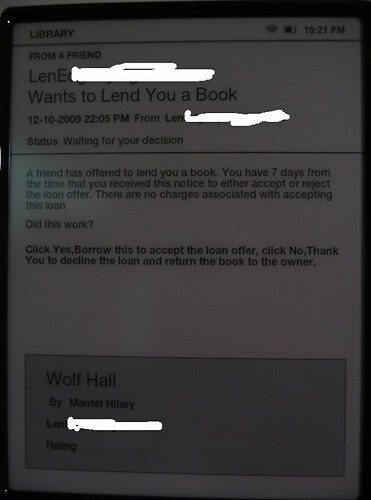 The Lending feature wasn’t live the first few days we had our Nook e-readers, but as soon as Barnes & Noble launched the feature, Len used “lendMe” to send me a book from his library to my Nook. The LendMe feature works from any Nook-device including the eReader, PC, Mac, BlackBerry, iPhone and iPod Touch Nook apps. When you “lend” a book to a friend it stays with that friend for 14 days and its restricted so that the friend can only receive that book once. A bit limiting really, but hey – it’s better than what you can do with the Kindle so while I agree it’s not as free as I would prefer, it’s certainly a nice-to-have feature. One thing I couldn’t figure out is as the person borrowing the book, how do you send that book back to the lender before the 14 days is up? If there’s a way, I didn’t see it. I also found out that as of right now there is no limit on the number of devices you can “attach” to a single Barnes & Noble Nook account. So you could potentially have multiple Nook e-readers, several iPhones with Nook apps, several PC’s with Nook apps all on a single account. This of course means you can buy one book and read it on all devices across your household – something we’re doing in my family with two Kindles. Note: Unlike the Nook, Amazon limits the number of devices on a single account. 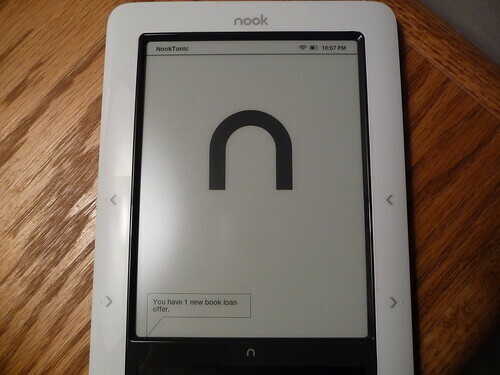 The Nook thus far is only available for sale in the U.S. The 3G service only works in the U.S. although you can use the Wi-Fi to connect globally according to the B&N FAQ. Like the Kindle, the Nook is very lightweight, thin, easy to hold with either hand and has a great e-Ink display. Great format support including ePub & library access! 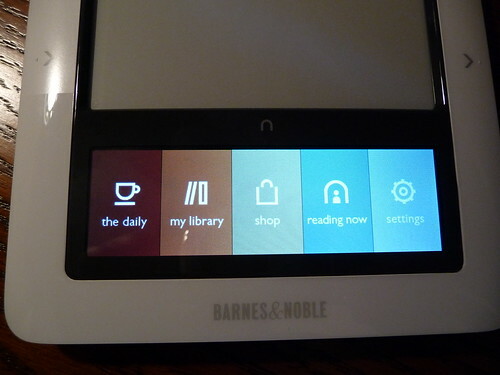 Hacker friendly – Hackers have already rooted the Nook. Just for starters Pandora Radio, Improved MP3 Interface and other features added via hacks and that’s just in the first few days. Lending – it’s not perfect, but better than anything of the competition. No limit on number of devices with a single account! This Nook review has been a tough one for me. On one hand I’m disappointed with the problems we see on the touch-screen UI. But I personally feel most of those problems will be fixed with a future firmware update – and I don’t think any of the UI issues are show-stoppers for me at least. If I stop there, the Nook loses to the Kindle. But add in the advantages the Nook brings like the ePub support (free popular books anyone – not just those ancient google books either), the possibilities added with the hacks we’re already seeing, the lending and WiFi. You take those additional items and your decision is so much more difficult in my eyes. If I’m advising my parents or even my wife, I have to go with the Kindle as the preferred e-Reader until they fix the issues with the UI on the Nook. You can read the Kindle reviews from a geek’s perspective and hard-core reader’s perspectiveof the Kindle for comparison. But if you’re more of a geek like I am – someone not afraid to be an early adopter. I think this device is worth taking a chance on. I’m not keeping this Nook – I’ll either be returning it or selling it to stay within my tight Christmas spending budget this month. But I’m seriously thinking of buying the Nook come February or March depending on what we see at CES. For the geek (or technically savvy if you’d prefer) I think the Barnes & Noble Nook e-Reader, warts and all is a strong buy. Stay tuned for the companion review of the Nook done by my wife – from the non-geek, hard-core reader’s perspective that will be posted on GeekTonic tomorrow morning. If you’ve been paying attention you know the Nook sold out fast. Matter of fact if you go to the B&N website right now you’ll see that you can only pre-order one for delivery in February! So the demand is there. You can also go to most Barnes & Noble stores and see one for yourself now. I’m betting we’ll see a small firmware update this week or next with a more major set of firmware updates in the coming month. You have time to wait and see since most of you can’t get your hands on one to buy for a while.